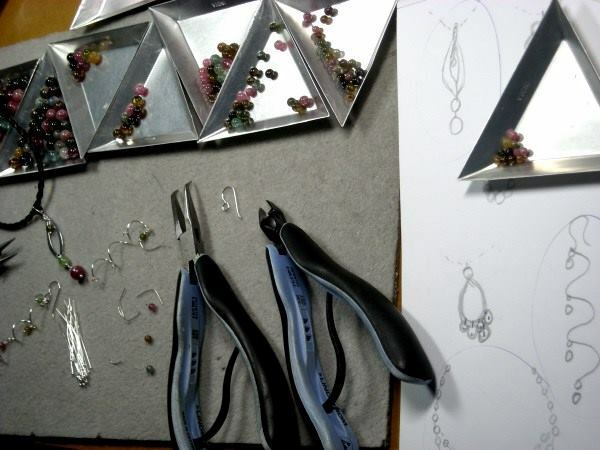 I offer a comprehensive repair, restringing and remodelling service for your old jewellery. Repairs can be made to your old and/or broken costume, pearl and gemstone jewellery. Repairs and maintenance such as cleaning gemstones, repairing clasps and replacing broken clasps and earring fittings, replacing earring backs and restringing are frequently undertaken. For anything more than a simple repair, please contact me so we can discuss how effective the repair will be, what results you can expect and the estimated costs involved. If you have pearls or beaded strands that have broken, stretched, need shortening or lengthening or a replacement clasp, then you need my restringing service. During this process you can have additional gem, pearl or precious metal beads to enhance the look of your necklace or bracelet. I can usually supply replacement clasps, pearls, gems and beads, depending on availability. Restringing can be standard stringing onto strong jeweller’s wire or knotted in between each pearl/bead with silk thread. Jeweller’s wire is very sturdy but it can get kinks and show signs of wear from heavy or hard stones which can weaken it. It is best to be examined regularly and restrung if showing such signs of wear. Silk wears out over time and knots eventually stretch out, abrade, fade, and get dirty. If you think your pearl necklace or bracelet is looking old…restring it! Heirloom pieces can be restored as close as possible to the original or changed as per your wishes. Costs for standard restringing start at $20 for a bracelet or short necklace plus the cost of any replacement parts. Costs for knotting start at $25 for a bracelet and $30 for a short necklace. Knotted opera length or multiple strand necklaces start at $60.00 plus the cost of any replacement parts. Do you have jewellery that is sitting in your drawer or cupboard that you never wear? Are you bored with plain necklaces and bracelets and want some life added to them so that you’ll want to wear them again? Would you like something ‘new’ without having the cost of buying a whole new piece? Then take advantage of my remodelling service. Many necklaces, bracelets and earrings can be given a new lease of life if they have something special added to them. Sometimes a number of necklaces can be combined to make multiple new pieces. Let my creative skill design something new and exciting for you. Please contact me to discuss the possibilities! Remodelling a necklace can start as low as $40 plus the cost of additional beads, gems, pearls, metals and so on, if required. Contact me for more information on these services.